by Mike Ashenfelder • July 16, 2013 • Comments Off on You Say You Want a Resolution: How Much DPI/PPI is Too Much? Migrant Mother” by Dorothea Lange. Courtesy of the Library of Congress. Preserving digital stuff for the future is a weighty responsibility. With digital photos, for instance, would it be possible someday to generate perfectly sharp high-density, high-resolution photos from blurry or low-resolution digital originals? Probably not but who knows? The technological future is unpredictable. The possibility invites the question: shouldn’t we save our digital photos at the highest resolution possible just in case? 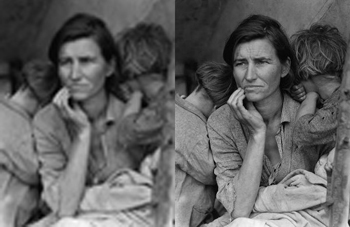 In our Library of Congress digital preservation resources we recommend 300 dpi/ppi for 4×8, 5×7 and 8×10 photos but why not 1000 dpi/ppi? 2,000 dpi/ppi? 10,000 dpi/ppi? Is there a threshold beyond which the pixel density is of little or no additional value to us? Isn’t “more” better? Recently we received a comment at the Signal in response to a blog post in which the commenter expressed concerns about our ppi/dpi resolution recommendation. The commenter raised some intriguing issues and I asked two digital photo experts to respond to his concerns. Barry Wheeler, one of the experts who responded, is a photographer, staff member of the Library of Congress and one of the digital photograph preservation researchers for the Federal Agencies Digitization Guidelines Initiative. Wheeler has also written several blog posts for the Signal about scanning and photo digitization. David Riecks, the other expert, is a photographer, co-founder of Controlled Vocabulary and PhotoMetadata.org. Riecks has written several blog posts for the Signal about photometadata and about processing digital photos. Below are the comments from all three people. Please read them through and decide for your self what the best digital photo resolution for archiving is. I am concerned that advising people to save at 300 dpi will result in lots of regrets for future generations. The quality of printing, computer monitors and televisions will continue to improve (and thus the ability to see details in higher quality imagery). Also, a person may want to zoom in and view just a portion of a scan or even cut out a piece (just their grandmother from a school group photo) all of which will suffer from 300 dpi. I believe that 600 dpi is a better recommended minimum size. It’s better to build the quality into the original scan (saving as a TIFF), then saving JPEGs from that for sharing with relatives or posting online (for smaller file sizes). I recommend looking at the “use cases” of scanned photography and as well as better future proofing recommendations. 600 dpi does cause larger files, but with hard drive prices coming down I believe the value is worth it. I think the answer really revolves around what you are scanning. For “photos” (i.e. a photographic gelatin silver print, or chromogenic dye print like RA4 process), you can scan at a higher resolution. However, in most cases, all you will see are the defects. If the original you have to work with is a 4 x 6 inch print, and you scan it at 600 or 1200 pixels per inch, you could then make the equivalent of an 8 x 12 inch print, but it’s not likely to give you better quality. It will…take up much more space on your hard drive. If you have a high-quality 8 x 10 inch glossy print, in which the image is sharp (no motion blur from the camera moving), it might be worth going to a higher sampling setting. But I would recommend that you do some tests first to make sure it’s worth it. In my experience, higher scanning resolutions usually just give me more dust to spot out later and the enlarged images never look as good as the small original. If you are scanning a b&w or color negative or a color slide, then you certainly want to scan at higher resolutions. Which is best has much to do with your intentions (now and in the future), the quality of the original and the type of hardware you are using to make the scan. Many scanners advertise an interpolated sampling rate in their “marketing speak” though you will often get better results scanning at the maximum “optical resolution” of the scanner. First, begin with how much detail is there actually in the original. This amount of detail varies widely. A halftone screen for an old newspaper may result in less than 200 dpi actual. A modern lens on a quality black 7 white emulsion may be 2800 dpi. For example, at the Library of Congress we currently print our digital photographs using high quality pigment printers that may claim a resolution of 1200 or 2400 or much, much more. But those are microdots of different color merged to produce the variety of shades of gray or color. Usually the printer driver produces a finished resolution between 240 dpi and 360 dpi. Second, we need to sort out the term “resolution.” Scanners and cameras contain pixels and “sample” the image at a “sampling rate” depending on the distance between the camera and the image. So when people talk about “resolution” using 300 ppi or 600 ppi or 3000 ppi they are actually using the “sampling rate” of the device. But few devices are 100% efficient. Common scanners may be only 50% efficient; cameras may be 80 – 95% efficient. Thus the actual resolution achieved at 300 ppi may only be about 200 ppi – higher ppi rates are the result of image processing which may give the appearance of sharper lines but which does not produce additional detail. Many scanners will claim 1200 ppi and produce less than 600 ppi true optical resolution. Federal Agencies Digitization Guidelines Initiative standards (http://www.digitizationguidelines.gov/) are currently at 80% efficiency for a 2 star, 90% for a 3-star, and 95% for a 4-star outcome. Many of our projects for prints and photographs and rare books are 400 ppi at 3-star levels, although some are much higher. But once you reach the limits of the device resolution and the detail in the original, then additional enlargement doesn’t help. I think I have a couple of illustrations of this in my most recent blog article about enlargement (http://go.usa.gov/j2q4). I don’t believe you can magnify a newspaper image and find additional detail in a scan with a true resolution above 300 ppi. Finally, Apple claims that human vision is only capable of resolving 326 ppi (search online for their “Retina display” marketing materials). There is a lot of quibbling about that number but most still claim not more than 450 ppi. In the end, I doubt that you will see any significant improvement in an image of reflective materials beyond an ISO standard resolution of 400 ppi. I doubt you will find any improved image quality on consumer scanners above an ISO standard resolution beyond 1200 ppi unless you scan 35mm film in a specialized, high quality film scanner. Two final notes. I believe the costs of higher resolution are vastly underestimated. Scan time will increase significantly with increased resolution. Transfer times increase, processing times increase. The expertise needed increases to get better quality. Storage and multiple backups increase. Consumer hard disk drives are not archival devices. Your children and grandchildren may not be able to retrieve images from a hard disk even 15 years from now. Increased image size means greatly increased cost. And I believe 300 ppi / 400 ppi is future-proof. At least for reflective materials, I don’t believe we will see greater detail in a 1200ppi scan no matter how improved future equipment is. This is a syndicated post. Read the original at The Signal: Digital Preservation 2013-07-16.